I’m not sure what it is about fermented foods that has me so enthralled. The probiotic aspect is great – and the flavors are like nothing else – but I think more than any of that, it’s just so dang cool to see these things work! I get like silly excited every single time! What can I say – I’m a food geek. My latest ferment, known in certain circles as dilly carrots, was so simple to put together and by day 2 it was bubbling away doing all kinds of healthy sciency stuff in the jar. Day 3 Dilly Carrot Ferment. 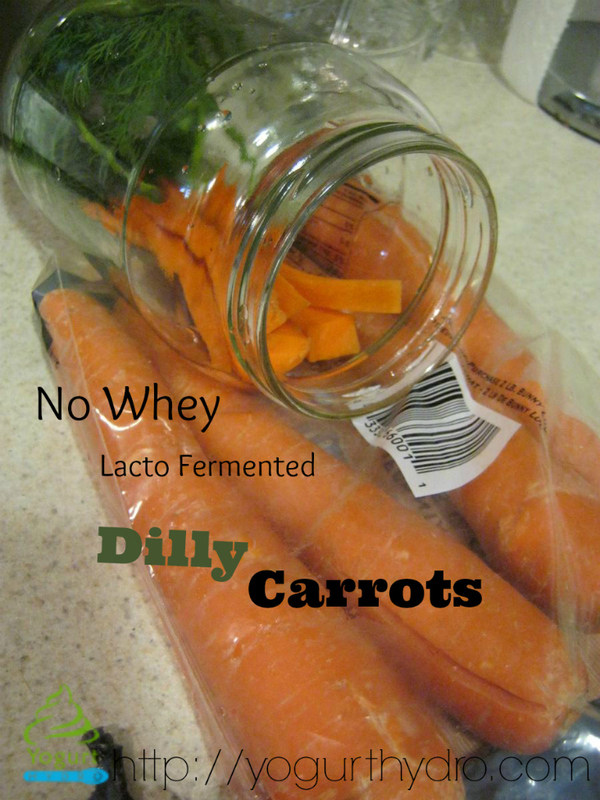 If you’re new to the world of fermenting, this dilly carrots recipe is an easy one to get started with. All you need is carrots, water and (non-iodized) salt. Dill is a perfect compliment, but you can experiment quite a bit by adding cloves of garlic, onion, and other herbs and seeds. The magic of lacto-fermentation does all the work. Lacto refers to Lactobacillus, a lactic acid bacteria (probiotic) and has nothing to do with dairy. Although some people use whey to speed up the fermentation process, it can sometimes lead to a rather icky slimy texture which I’d prefer to avoid. These digital scales are perfect around the kitchen. I love the flat design – it makes it super simple to store. Just measure out the salt and dissolve it in water. Dechlorinate your water first so it won’t interfere with fermentation. To dechlorinate water, just leave a jug of water on the kitchen counter overnight (12 – 24 hours). The salt ratio is important for a safe ferment. If you change the recipe, keep the brine ratio at 4 cups water:19 grams of non-iodized salt. I also stirred in some dry mustard powder (I thought we had mustard seeds when I started and wasn’t about to change my mind about adding it!). Wash carrots well but don’t peel them. Slice ’em up however you like. You could even shred them if you’re so inclined. I made my dilly carrots using tall thin slices for grabbing and eating straight out of the jar. The smaller the carrot slices, the faster they will inherit all the yummy pickle-y flavor of the ferment. 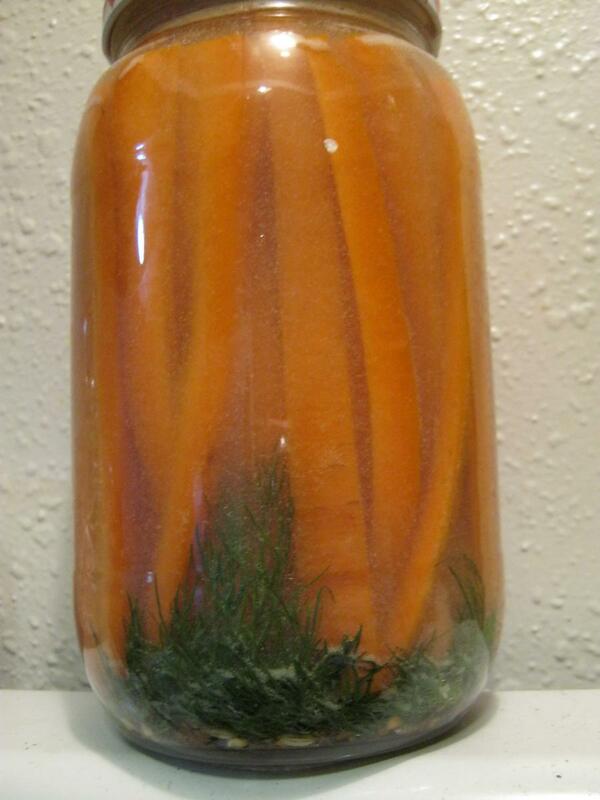 Make sure to leave room at the top of the jar to fully immerse the carrots in brine. Throw some other flavorings like caraway seeds and peppercorns in a sterilized jar and pack everything in. If you don’t have an ideal way to weight the carrots down to stay under the brine (like a fermentation weight ), just pack the jar extra full to keep the carrots submerged. Cover the jar with a lid and leave it at room temperature a few days. Open the jar daily to release excess off-gases (or your jar could explode from excess pressure). Once the bubbling stops (between 5 – 10 days depending on room temperature) it can be stored in the fridge for at least 6 months (but it probably won’t last that long:)). Wash and sterilize a 1 quart jar. Mix 4 cups dechlorinated water with 19 grams coarse sea salt (or other non-iodized salt). I used 4 tsps. dry mustard powder, but if you have mustard seeds, add 1 tsp. of them to your fermenting jar instead! Wash and cut about 6 carrots, enough to pack jar well. Pack carrots over dill and seed mixture. Add brine to cover carrots completely. Cover with a lid and leave at room temperature. Open jar daily to release gases. When your Dilly Carrots stop bubbling (between 5 – 10 days depending on temperature), store in fridge until ready to eat. Carrots will last in fridge 6 months. Marvel over the simple and yet wondrous fermentability of so many good things! Thanks Kim. :) Let me know if you try it! These sound so good and how interesting! My goodness your recipes are divine! Thanks Starla. :) I’ve been trying to let the carrots ferment for a couple more weeks, but I keep sneaking snacks from the jar lol. I think I will do 2 jars next time and hide one in the back of the fridge! I know it’s awful and geeky but this is extremely cool! Probiotics are it baby! LOL, I agree! With all these odd jars of ferments, foraged foods, and kefir around, Kevin thinks I’m in the kitchen doing Voodoo lol. A very interesting recipe! I’ve never heard of this fermented before. Gotta try! Let me know how it works for you Mai! Thanks Linda, I hope you’ll try it! Thank you for the recipe. We all love carrots at our house. Thank you for the recipe. My husband loves carrots. Never tried carrots like this! Sounds super healthy!! I am definitely not a foodie! And, this was very interesting to read…but, I must admit, I don’t think that I will be making the “dilly carrots”. But, thanks for sharing!!! 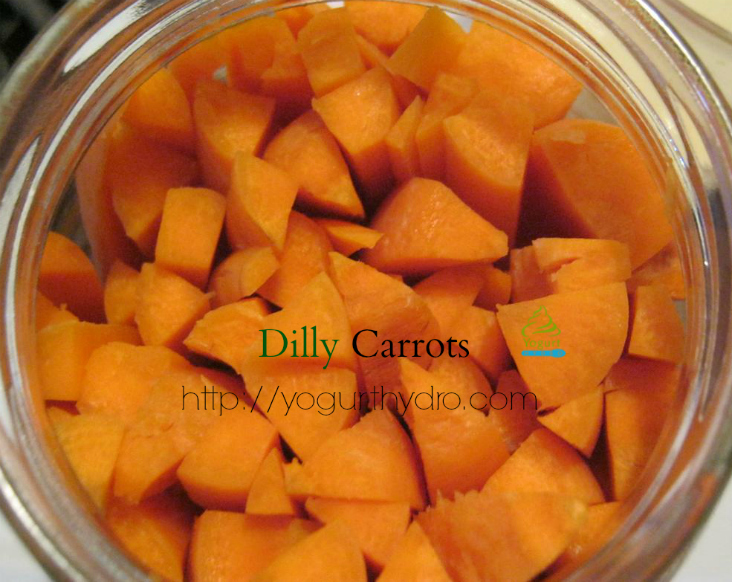 Thank you for posting how to make Dilly Carrots. I am going to try to make these because I have heard that they are good for you and taste good too. I think I will give this a shot and see how it goes. It sounds really good. The first fermented veg I ever made was Sally Fallon’s ginger carrots which were delicious but grated. I love the idea of these chunky carrot sticks to snack on or eat with a meal. And carrots are good at keeping unwanted guests out of our gut – apparently all parasites loath raw carrot! I’ve just found you as I have so much horseradish in my garden here in North Wales, UK and I was about to compost it but thought maybe I could spice up some fermented cabbage etc. And there was your recipe! I can’t take caraway so I usually use star anise and cumin seed among other spices. Thank you for sharing the recipe. And the grated horseradish certainly cleared my sinuses well and truly!